Ahoy there matey, do you have a pirate boy on your hands? 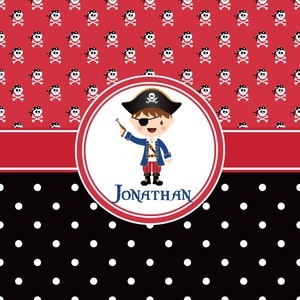 If so, then he is sure to love this classic black, red, and white skull and crossbones pirate print. The skull and crossbones are highlighted using a backdrop of red. They are adorned with black and white polka dot dew rags. The coordinating bottom pattern of the black and white polka dots, taken from the skull and crossbones' dew rags, ties the entire design together.